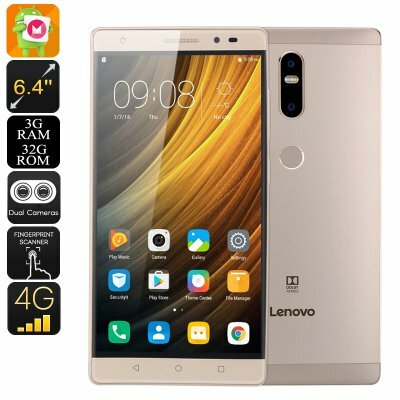 Successfully Added Lenovo Phab 2 Plus Android Smartphone - Android 6.0, 6.44 Inch FHD, 2xSIM, 4G, Octa-Core CPU, 3GB RAM, 13MP Dual-Cam (Gold) to your Shopping Cart. The Lenovo Phab 2 Plus is an affordable Android phablet that, despite its cheap price, comes packed with sophisticated hardware and the latest software alike. On its large 6.4 Inch Full-HD display, you will be able to enjoy movies, games, and applications like never before – bringing along a great on-the-go entertainment experience for all media lovers out there. Android 6.0 brings forth a powerful performance that lets you enjoy the latest Android features and applications alike without experiencing any lag. For those of you that are looking for a great user experience that comes at an affordable price; the Lenovo Phab 2 Plus is the answer. Packing an epic 4050mAh battery, this 6 Inch Android smartphone packs enough juice to let you enjoy all its features for up to 5 hours in a row. Watch several episodes of your favorite series, enjoy an FHD movie from beginning to end, or play games and browse the web endlessly – with this Android phone at your side, you’ll never have to worry about feeling bored again. Coming with two SIM slots, Dual-Band WiFi, and 4G support – it is guaranteed to bring along great connectivity on the go. Stream movies, browse the web and stay connected to loved ones anywhere you go with the Lenovo Phab 2 Plus Android mobile phone. This stylish Android phablet holds an ultra-fast fingerprint scanner, letting you unlock your phone and access all your files with the simple touch of a button. Additionally, the rear of the phone also features a professional-grade 13MP camera that snaps breathtaking images and Full-HD video of all those special moments in life that you wish would never be forgotten. With its 5MP front snapper, it lets you engage in 1080p video calls anywhere you go, allowing you to stay in touch with your loved ones no matter where you’re at. Coming with a powerful Octa-Core CPU and 3GB RAM, this Android smartphone is guaranteed to tackle the most demanding of tasks. It furthermore packs the ARM Mali T720 GPU that brings along great visuals and vivid color while enjoying the most graphically demanding mobile games. Whether you’re into movies, games, applications, or simply like to browse online – this Android smartphone is guaranteed to deliver a great visual experience. The Lenovo Phab 2 Plus comes with a 12 months warranty, brought to you by the leader in electronic devices as well as wholesale electronic gadgets.. This is the best phone I have ever owned. all apps have performed excellent. Its has more than enough storage. I would tell all. What a great phone.! The waiting. Really is worth the extra for shipping. Je viens de recevoir le produit. Il a mis 2 semaines pour me parvenir. Il est magnifique comme sur l'annonce. Bonne prise en main. Je le reste actuellement. Qualité rapport prix, rien à dire. Je le recommande.